based on incidents that were reported in the local media from January 2017, to September 2018.
increased kidnap attacks along the highways and incessant kidnap incidents in Birnin Gwari LGA. abducted between the hours of 9am-2pm, or just at the start of dusk at 7pm. 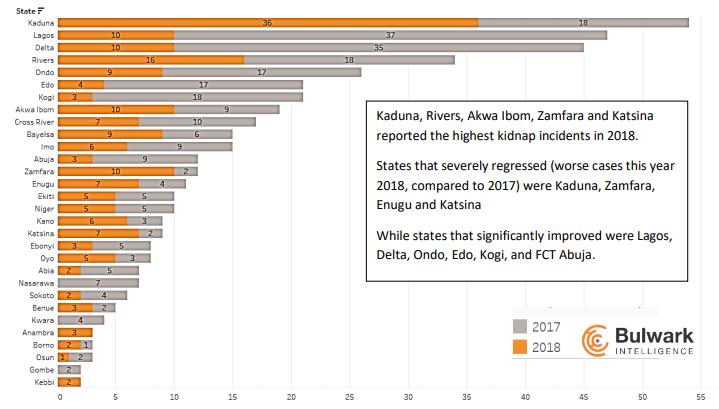 Kidnap levels in Nigeria between 2017 and 2018 (up to the 3rd quarter) has remained relatively the same. June and July also recording the highest cases. Kidnapping in Nigeria is a lucrative venture because Nigerians pay the ransom. And quite frankly, you can’t blame them because securing the release of their loved ones is the priority. Pouring through the details of kidnap incidents reported in 2018 thus far, reveals some of some of the triggers, motivation,and reasons why kidnapping persists. The fundamental cause of kidnapping in Nigeria remains poverty. An example was an incident which took place in Imo state, where a group of armed young men went to a mortuary, stole (or abducted) a corpse and demanded N5 million from the mortuary management for the body to be released. That case was probably a combination of poverty and likely intoxication. owner. The victim raised an alarm and the kidnappers fled. However, this criminal under the influence of drugs, kept stumbling and was eventually caught. He was still passed out 6 days after the incident. relatives or employees, (this was mostly the case in the abduction of children). the staff because they were familiar with the abductors. Local Government Area of Akwa Ibom was abducted from his palace. Reports indicated that he was likely targeted because he had been speaking out against the activities of cult groups on the area. Within the same community, a youth leader of Udianga Enem community in the Etim Ekpo Local Government Area of Akwa Ibom State was abducted around 6am from his residence. He was targeted because he had been actively raising funds for security in the community. professional kidnapping syndicates. Below were some observed TTPs (trends, tactics and procedures). 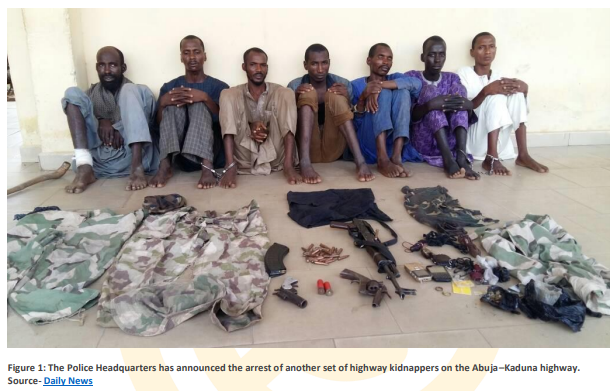 were abducted by about 6 gunmen in military uniform; they demanded 15 million in ransom. The Nigerian military probably needs to look into uniform redesigns. In addition, more should be done to reduce the ease of obtaining uniforms. tactic. In July in Birnin Gwari, armed bandits intercepted Cement trucks and passenger vehicles, shooting sporadically, killing one and abducting a few others. The same tactic was used in the Bayelsa abduction of the retired oil company worker’s spouse. at night, with all the noise and shooting, for 45 mins, there was no emergency law enforcement response. criminals? It is important that the various states understand the threat unique to their environs and equip their local police commands to effectively tackle it. daylight, there was no immediate response from Security forces. average ransom request seen this year was approximately N15 million. Payment of ransom is usually not reported publicly, but there are many indicators that reveal ransom is frequently paid. This then presents a unique opportunity for law enforcement to track down kidnappers through electronic signals used in tracking/tracing the dropped off hard currency. Other global anti money laundering tactics can be applied to follow the money trail. were going to maintain contact. to give her husband for further communication. The use of biometric forensic analysis on such devices could help in identifying the identities of the kidnappers. Again, another case for the importance of maintaining biometric databases. Also, having quick intervention and cooperation with the Telecoms companies, to track the origin and destination of communications is vital. go during the dark hours. incessant reports of such in July 2018.
watched by their older sibling of 11yrs old. followed the known security guard. abduction of children within the state. • A 6 year old in Delta disappeared. He never showed up to be picked up by his school bus. • In Anambra, two children were abducted from school in Amawbia Akwa South LGA. didn’t involve an internationally known terrorist group. because it can be lucrative to take them as the congregation puts money together for their ransom. Birnin Gwari area to perpetrate crime. Most incidents reported in Birnin Gwari occurred while the victims were in transit. 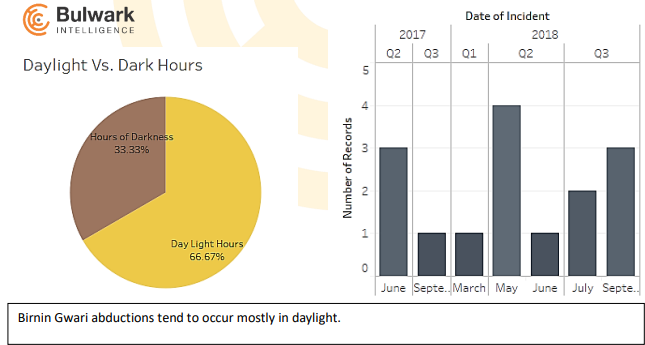 While over 66% incidents occurred in broad daylight. to celebrate the end of the year activities. abductions, assassinations, homicides, riots, traffic robberies and more. kidnap incidents the fourth quarter of this year. Nigerian youths. This likely encourages young jobless Nigerian youths to engage in crime. Tackling these issues will be a first step in curbing the kidnap epidemic in Nigeria. cases before they even occur. criminal operation is imminent or ongoing, including when they hear sporadic shooting in the air. they will be deterred from their nefarious act. known to utilize motorcycles, need rapid motorcycle response units.